Are you tired of having to use a different type of knife every time you need to slice, dice or mince food in the kitchen? Wouldn’t the daily task of preparing home-cooked meals be so much easier and enjoyable if you had a versatile, multi-purpose knife that you could do it all? If you’ve just nodded your head in agreement, there is a simple solution for you – a Santoku knife. Like many other Americans, you might have heard about the Santoku knife but have little knowledge about it. Well, this is quite understandable. After all, the name “Santoku” may sound rather alien to you. So, why the unusual name? “Santoku” is a Japanese word roughly translated as “three uses” in English. The Santoku knife derives its name from the fact that the knife can be used to perform a triad of kitchen cutting tasks - slicing, dicing and mincing. The comfortable, well-balanced grip that this Japanese-style knife provides ensembles its multi-purpose design. Are all Santoku knives made the same? While all Santoku knives are designed to offer a triad of cutting abilities, each knife is unique in its own way. Below is a look at 10 best Santoku knives that give the best value for money right now. Kitchen knives used frequently or for heavy cutting applications need to be strong to withstand the extremes of daily use, but should also be easy to sharpen since they tend to lose sharpness rather quickly. The Genesis 7” Forged Santoku Knife by Mercer Culinary is made of forged high-carbon steel, which offers a number of important benefits as a knife construction material. To start with, steel knives with high carbon content are desirable because they are extremely hard and strong, but also easier to sharpen even though they are harder than other forms of culinary-grade steel, like stainless steel. Second, carbon steel is made sturdier and more resilient by the forging process. If you are looking to make a lot of precision cuts on the kitchen cutting board, you are going to love using the 7” knife from Mercer Culinary. The bolster – the collar or band at the junction between the knife blade and the handle – reinforces the knife, increases longevity, and provides the stability required to maintain a proper grip of the knife when cutting food. The ergonomically well-designed Santoprene handle is comfortable to hold and provides a non-slip grip. 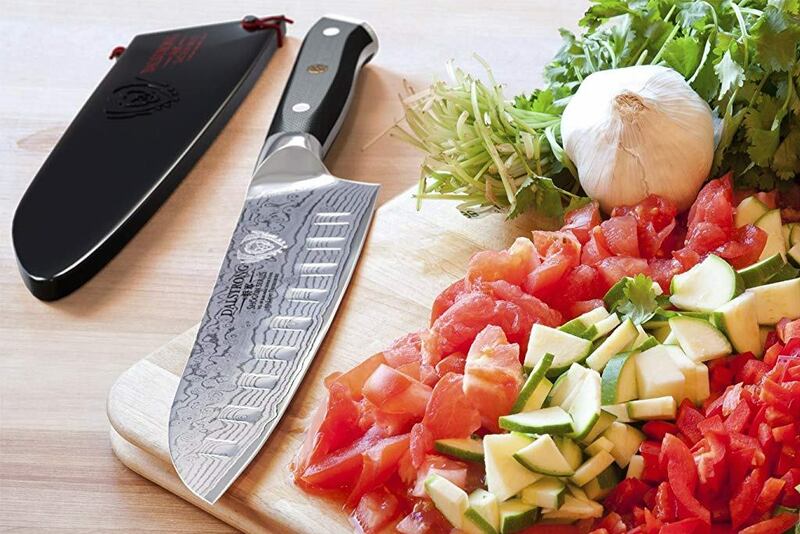 Do you like your chef knife but wish it could function like a cleaver? If the answer to this question is a yes, then you may need to add Victorinox’s 7” Fibrox Pro santoku knife that comes with a Granton blade to your kitchen cutlery set. 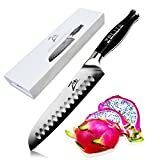 This 7” knife adds the features of a cleaver to a standard chef knife, and can function as a spatula for scooping veggies or whatever you may be chopping on the kitchen cutting board. Another feature that makes this santoku knife stand out from the rest is its Granton or scalloped edge, which creates fine pockets of air for easier and faster cutting of food items, but also prevent the food from getting stuck to the blade. 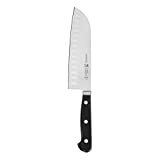 This type of Santoku knife is often used by pro chefs, butchers and other places where high productivity is required. So, if you are looking for a knife to use when you are running short of time to cook, you should consider giving this knife a whirl. Are you looking for a Santoku knife that seamlessly blends excellent functionality with mesmerizing beauty? If you are, the Shogun Series 7” santoku knife from Dalstrong may be exactly what you need. This kitchen soldier has a blade comprising 67 layers of high-carbon stainless steel – an interior layer meticulously forged between 66 layers of steel – to provide remarkable strength and durability. The knife’s appearance is a thing of beauty. While some Santoku knives come with a perfectly straight blade, others have a noticeably bent blade. This santoku knife has a slightly curved blade – a delightful compromise between the two conventional options. Because any good kitchen knife should be safe and comfortable to hold, the Shogun Series 7” santoku knife’s Ultra-premium G-10 handle is crafted for better grip and comfort. Plus, the handle is resistant to moisture, cold and heat, so you don’t have to worry about damage that may be caused by those elements. Whether you need to dice onions, minced garlic or slice pineapples, this santoku knife made in Spain has all your needs covered. It is made using German stainless steel, and is hot-drop forged for extra weight, strength, and durability. It can stay sharp for a long time despite frequent use, thanks to its precision, fine-edge blade. In addition, it has a full bolster, which provides counter-balance for proper grip, but also ensures a smooth transition from blade to handle. Speaking of the handle – the traditional, triple riveted design of the handle offers comfort and durability, but also gives balance when using the knife, even with wet hands. The hollow edge of this santoku knife helps cut food into thin slices or pieces that won’t stick to the blade. It is also possible to scoop up minced garlic, chopped veggies or whatever you’ve been cut using this 7” knife. With regards to appearance, the professionally satin-finished blade gives the knife a high-end look without breaking the bank. The versatility, comfort, durability, and appearance of this knife make it one of the best santoku knives for any cost-conscious individual. Quality, comfort, value, and performance – are these the top features you are looking for in your best Santoku knife? If that is the case, you should try the 7” santoku knife from Zelite Infinity’s Comfort-Pro Series. In terms of value for money and overall performance, this kitchen warrior ranks high. This 180mm knife is ideal for performing multiple kitchen cutting chores, including chopping, mincing, slicing, and dicing all fruits and veggies, meats, and more with great precision. The hollow edge of the knife helps ensure food pieces fall away after being chopped. This way, you won’t have to worry about some food sticking to the blade when you are using your knife. If you are looking to bring efficiency back into your kitchen, take control of things by getting yourself this santoku knife. 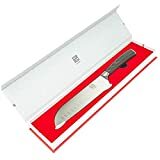 If you think that the large size santoku knives may not be ideal for your light cutting chores in the kitchen, why not get yourself smaller models of the knives? As part of the Revolution series, Kyocera offers the Paring and Santoku Knife Set. This is basically a 2-in-1 knife set consisting of a 5.5” santoku knife and a 3” paring knife. This two-piece set is made from top-notch ceramics blades. The blades are white in color and retain their original color because they are unaffected by water, salts, oils, acids, or other elements that typically cause dulling (rusting and corrosion) on virtually all metal knife blades. They are easy to use and best for repetitive cutting due to their lightweight design. Though the blades on these knives are not made of metal, they offer considerable strength and durable. 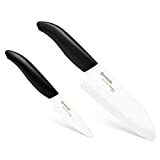 As long as you use these knives for the intended purpose (light cutting such as cutting fruits, veggies, and meat without bones), they will serve you just fine. Best for cutting fruits, vegetables and boneless meat. With this 5-Piece Santoku Knife Set from Top Chef, you will have everything you need to take your knife handling skills to the next level. 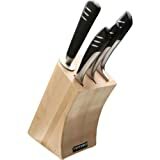 This santoku knife set comprises a 7” santoku knife, 5” santoku knife, 3.75” santoku, a sharpening rod, and a wood block with a slot for holding each item. All the knives are made of stainless steel and have precision-cut edges to keep the knives sharp for a long time. In addition, the blades are hollow ground to prevent chopped food from sticking to the knives. 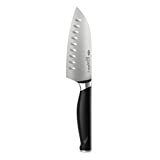 The blade and handle are seamlessly bonded with polished bolsters, which give the knives an attractive look. 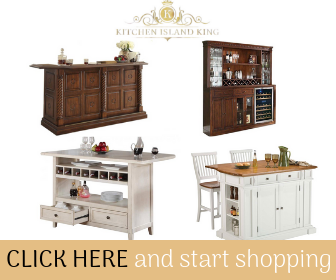 The best part is that this 5-piece set is relatively inexpensive to buy. But why? Well, Top Chef manufactures these santoku knives in China, which helps them to considerably cut on the cost of production. Hence, the company is able to pass the benefit to you by charging a cheaper price. If you are a frugal person, this santoku knife set is a great deal for you. This santoku knife from Zelite Infinity offers amazing features, but perhaps the most noticeable feature is its stunning look. When it comes to style and elegance, few santoku knives can hold a candle to this 7” santoku knife. This knife is painstakingly embellished with a patented 3-metal mosaic rivet that has the potential to add grandeur to any modern kitchen. Its sharp blades ensure minimal resistance when you are cutting food, so cooking can be more fun. The triple-riveted, ergonomic and rounded handles on the knives are designed to ensure a safe and comfortable grip. The tapered bolster that bonds the blade and the handle adds strength and comfort. Zelite Infinity truly lives up to their reputation of delivering long-lasting products. The 67-layer high carbon stainless steel used to make the 7” Alpha-Royal Series Santoku knife is incredibly hard and strong. Plus, it offers excellent rust and corrosion resistance. These qualities translate into extended product life. There’s no way you will end up a loser if you add these amazing knives to your kitchen. Does a 4.5” santoku knife sound too small for you? If so, you may be surprised at what it can do. For optimal control, cooks require a knife that provides a really good grip. That is exactly what OXO had in mind when they were coming up with the design of the Good Grips Pro 4.5-Inch Mini Santoku Knife. In the end, the delivered this small and nice santoku knife that almost feels like a natural extension of the human hand. Ergonomically designed, this knife has a curved bolster and contoured handle to support your hand, thus providing the ultimate comfort and stability of grip when chopping, mincing, dicing and slicing. Made from stainless steel with high carbon content, the full-tang blade provides extra strength and durability, as well as superior edge retention to ensure quality cutting for many years ahead. Do you want a hard, strong and durable knife that is comfortable to use and offers extended blade sharpness? This santoku knife from ISSIKI Knives can make a great choice. It is made of high-carbon stainless steel, hence its sturdy and durable design. The high amounts of carbon contained in the steel also make the knife highly resistant to rust and corrosion. The blade’s sharp edge is vital for cutting veggies, fruits, boneless meat and other soft food items effortlessly for a long time without the need for sharpening. The blade is a bit shorter than a standard chef’s knife. As a result, it is easier to control without losing the capability to cut larger food items. What’s more, the water-resistant Pakkawood handle – Pakkawood is an engineered wood – won’t easily get damaged, even after several washes. When selecting a santoku knife for your kitchen, consider safety, durability, comfort, and aesthetics, as well as any other thing that matters to you. The best Santoku knife is the one that best fulfills your needs while still falling within your budget. Is an Electric Knife Sharpener Right For You?